The internet is great. But still there are things you can do in a local network that can not easily be done over the internet. Share a printer, share a folder, play a LAN game, etc. With the free virtual private network application Hamachi however, you can access your computer from anywhere on the internet as if you were home on your local network. Here’s howto install such a network using Hamachi. Hamachi creates a zero-configuration LAN over the internet. Any app that works over a local network can be used with Hamachi over the internet. Think about Windows file sharing, iTunes, Remote Desktop, FTP, VNC and gaming. All of Hamachi’s connections are secure, encrypted, authenticated and peer-to-peer. Though Hamachi acts as a mediator between your computers and creates the tunnel for their communication, Hamachi’s servers don’t listen in on or log your activity. You’re on the road with your laptop and want secure access to your PC’s files. Your office or dorm room computer is behind a restrictive firewall that doesn’t let you reach it from the internet. Download and install Hamachi. For the most part, the Windows installation is the usual “just click next” routine, except for two notes: Hamachi will attempt to install a virtual network adapter which Windows XP says is not supported. – just hit the “Continue Anyway” button at that point. Also, if you have Windows Firewall enabled (or any firewall, for that matter), it will ask if you want to allow traffic to and from the Hamachi client. You do. 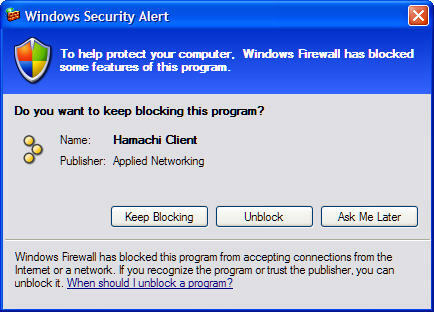 Click the “Unblock” button to allow Hamachi traffic through your firewall, as shown. Create your Hamachi network. Once Hamachi’s installed it will walk you through a quick tutorial to get you started. Read it – it’s worth it. 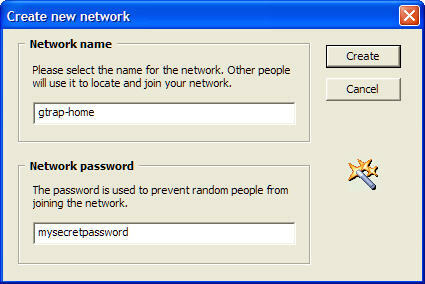 Then, hit the network button (bottom right hand corner, second button to the left) and choose “Create new network” from the menu. 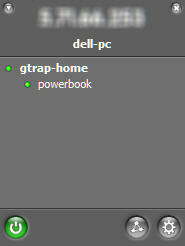 Give your network a name (On the image it was “gtrap-home”) and a password. Click the Create button. Join your Hamachi network. At this point you can tell your friends or co-workers your Hamachi network’s name and password so they too can join it with the Hamachi client installed. Streaming music is only one example of what can be done with your virtual home network. Browse shared Windows folders, remote control your PC, access an FTP or web server (over Hamachi’s encrypted connection). Anything you can do locally you can do over the internet with Hamachi.